Have you ever wanted to include an interactive map on your website, but you just don’t know the technical stuff behind doing it? 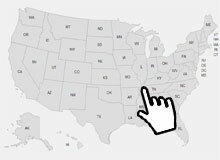 Even if you aren’t tech savvy- there is a way that you can create these maps- even custom maps- to include on your site. With MakeaClickableMap.com you can create beautiful clickable maps that will not only be clear and concise, but also interactive. Let’s learn how it works, and see if it is worth your while. Step 2: Once you have your map loaded, you will then need to select the dimensions of your map. This is basically just the width and height of your map. This is something that you can adjust until you get it exactly where you want it, so don’t worry if your dimensions are a bit off at first. You can set only the width or height of the map, and the other variable will auto adjust, in order to keep the map’s proportions. Step 3: Once you have the dimensions set, you will then need to adjust the font, colors and hover colors. This is really where you can customize it to be exactly what you want it to be- because it will ultimately determine how the map looks once you insert it into your site. Step 4: The next option that you will need to choose is the background color. It is usually best to choose a color that will blend well with the color of your site’s background. This helps the map to look like it belongs on your site- rather than just an ordinary copy and paste map. Another option is to have a transparent background, that will blend with any background that’s behind the map. Step 5: Next, you will set the “Region” settings, which allows you to set colors for various areas on the map, including hover colors. Step 6: It is then time to set the Stroke color, type and width. This is basically the outline of the map, and you can customize it to either not show an outline at all, or to show a solid or dashed line. Step 7: For the final three settings, you will want to decide whether you want to open links in a new window, show the names of the places on the map, or show small tips when the area is hovered over. Step 8: When you complete these steps, you will be ready to finish up the map so that it will be ready for use. To do this, you will need to choose whether you want to get the map for free, or pay a small fee to give you options to edit it as many times as you’d like. Step 9: Once you choose your selection, the IFRAME code for your map will appear. You can then copy and paste it into the code of your site, and it will automatically show your clickable map when people visit your site. For those that know how to do code on their own, this may not really be a necessary tool- although it does take away most of the leg work, and can free up some of your time. For those that don’t know the coding world, then this tool can actually be a lifesaver. The maps are very affordable, and if you just need a quick map of the United States that won’t require editing, you can use the tool for free! There really is nothing to lose. We recommend that you try it out, and see how it works. You might need to play around with it a few times until you understand how all of the features work. Even the premium maps, such as the non-US maps, and other editable maps, only cost a small amount. For the convenience that this tool has to offer, we feel that it is well worth every penny spent to create a map! Give it a try today, and you are sure to find that it not only saves you time, but also helps you to have professional, concise maps that are ready in just minutes for your site. Upcoming planned features are responsive maps, inactive areas and custom hover colors for each area.